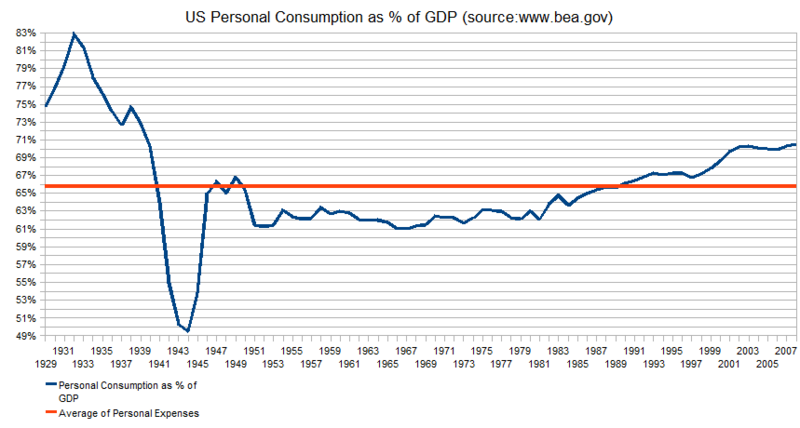 The recent consumption business cycle in the US can be easily quantified. The output of a country, its GDP, is approximated by adding those three components up and adding exports and deducting imports. The logic being that if someone consumed something, then someone must of course have produced it. Items exported are not consumed inside the country and thus not captured, hence they are added. Items imported are reflected in the components above, but they are produced outside the country, hence they are deducted. Consumption expenses give us an idea of how many consumer goods are produced in the country, investment expenses give us an idea how many factors of production are being turned out (duly accounting for exports and imports). It is completely safe to assume that government expenses can be equated to consumption. It is true that the government spends a fraction of its money on investments such as roads and other infrastructure. However, this fraction is almost negligible when compared to consumptive expenses on goods that are used up immediately and don’t aid in any production processes, such as military products and health care. As can be seen above, the percentage of goods produced for consumption by the productive factors in the US has historically oscillated between 79% and 98% since 1929. The average has been 86.27%. 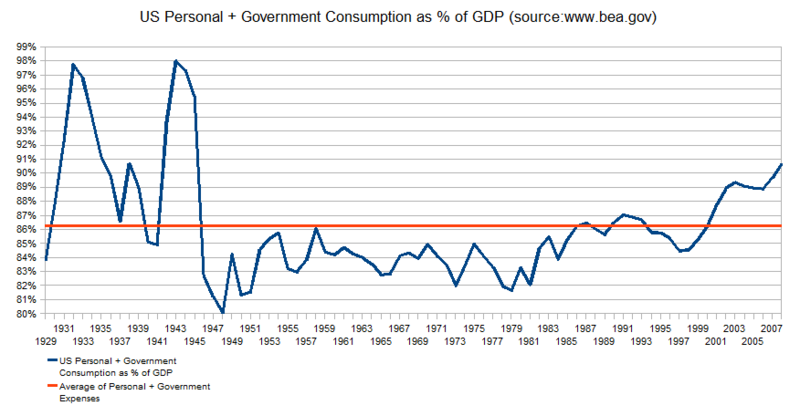 It reveals a severe drop in personal consumption during World War 2 which was more than replaced with government consumption. Where can we go from here? It is safe to assume that production of public and private consumer goods will at least fall back to the average of roughly 86%, but maybe even drop to around 80%, given the fact that corrections usually seem to overshoot that average and given the severity of the current correction. A good indicator of when a true recovery is near will be when investment expenses stop to fall and begin to bottom or even rise again. Meanwhile, the production of consumer goods may continue to drop while employment in businesses that produce factors of production should begin to absorb the released resources at some point. Businesses that produce this capacity may be attractive at that point. This includes in particular companies from the mining and drilling industries, such as the canadian energy trusts (examples: PVX, PDS, PWE, AAV). New AND old energy sources are likely to be explored and expanded. Alternative energy businesses, such as wind or solar energy may be worth looking into for people who understand the technological challenges that they are exposed to. Basic commodities should do well. 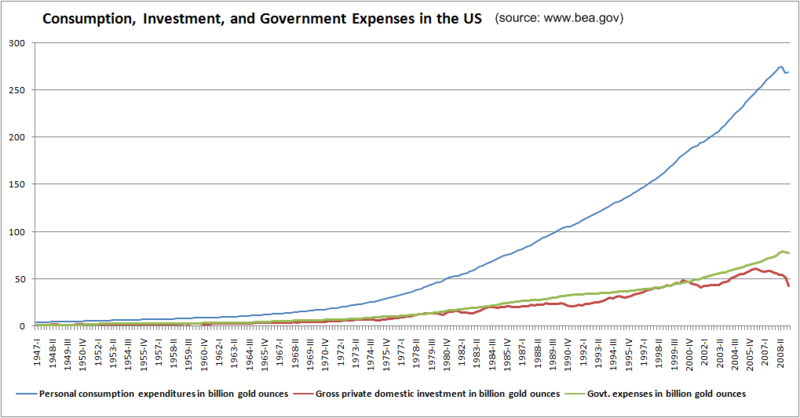 Gold and silver should continue to act well so long as people consolidate their finances and demand cash to pay off their debt.